Ecommerce solutions for Com5 Ltd resellers, VARs and MSPs, and a compare the market service to find stock in distribution. 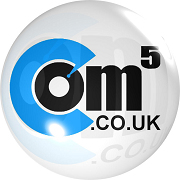 Com5 Ltd, an established company specialising in the distribution of Data Storage, Communication and Power Resilience Products. We aim to be useful and helpful to our resellers, our sales team know what terminator goes with this drive, which cable you will need for that library and what cable size the manufacturer recommends for that 30KVA UPS.